Summer is here and I’m looking for every opportunity to eat outside. In San Francisco the fog can roll in and the wind kick up at any time, so you have to be flexible. A few nights ago the weather conditions were perfect so I called hubby and told him to meet me at a park by his office. 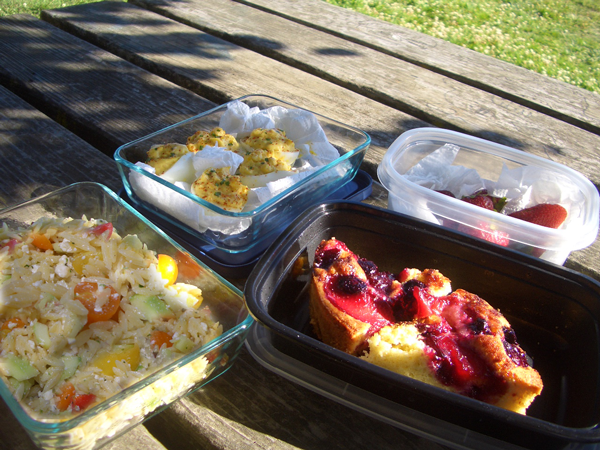 I only had two hours to throw it all together so the food was simple: deviled eggs, pasta salad, and fresh strawberries. Bottles of water. 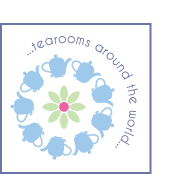 Thermos full of tea. There’s a cake in the photos and that recipe will come later–it’s not… quite right, yet. 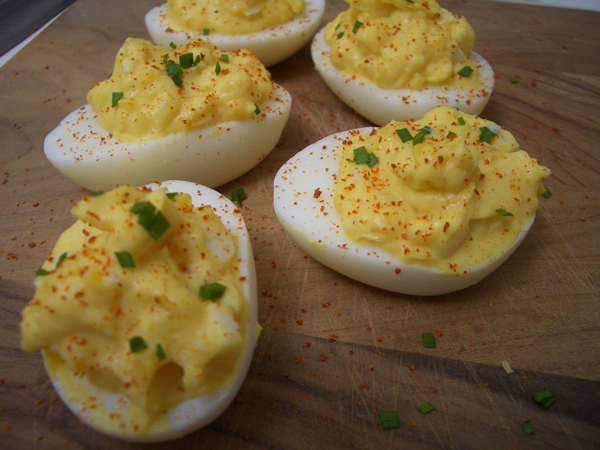 Deviled Eggs — make as many as you like, but one whole egg will be chopped up for the filling, so keep that in mind. Start with room temperature eggs. Preferably eggs that are at least a week old so they’re easier to peel. If you can, cook them in a pot large enough to have them all in a single layer so they’re less likely to dance around and break. Bring the water to a boil and cook for 12 minutes. Plunge the eggs into ice cold water. I find it’s a bit easier to peel them if you crack the cooked eggs and put them back in the cold water for a few minutes to let the water get between the membrane and the white. Carefully cut the cooked eggs in half and pop or scoop out the yolks. Chop one of the egg whites and add to a bowl with the yolks. 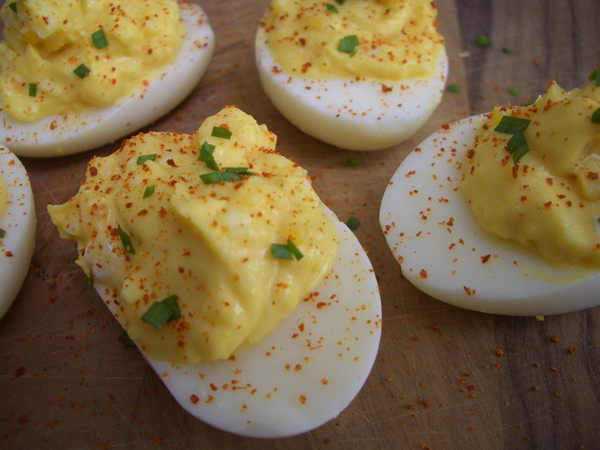 How much mayo and mustard you add depends on the number of eggs you start with and what you like. For a dozen eggs I would start with 1/4 cup (60ml) of mayo and 1 tablespoon (15ml) Dijon and 1 teaspoon of caper brine. Mash it all together. Taste and add more mayo, mustard or brine as needed. Add salt only if it needs it. You can pipe the filling using a pastry bag and swirly tip to give the eggs a fancy edge. I use a spoon and do the best I can. Sprinkle with herbs and spices of your choice. Refrigerate until ready to serve. If you have an egg plate that’s great, if not you can use strips of foil or paper towels to prop the eggs up in the container and keep them from falling over. Cook the orzo according to the directions on the package, rinse with cold water and drain thoroughly. 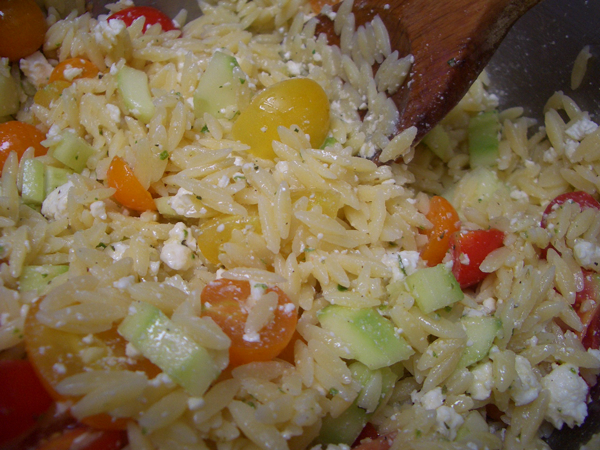 In a large bowl, combine the orzo, cucumber, tomatoes, and feta. Add the Greek Slather by the tablespoon until you have the flavor you like. I usually add 4-5 tablespoons. Store what’s left of the Slather in the refrigerator.